Margaret Baker was born around 1830 at Cork, Ireland. 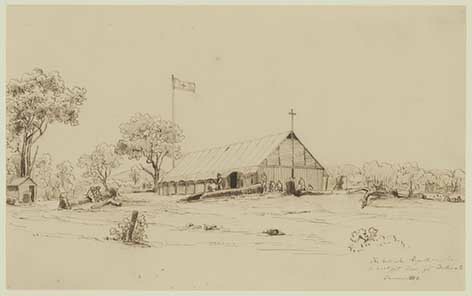 She married Hugh Brady/O’Brady at St Alipius', Ballarat East, on 16 May 1853. The marriage is not registered in the Victorian registrations, but handwritten in the St Alipius' Registers. Hugh and Margaret produced at least three children in Victoria: James Hugh (b.27 August 1854, Ballarat); John (b.12 February 1856, Ballarat); Hannah (b.1858, Ballarat). Their son, James, was baptised at St Alipius' with sponsors John Power and Ann Maguire. Another son, John, was baptised under the name O’Brady on 12 February 1856, the sponsors being James Keys and Bridget Holihan. Hugh Brady died on 10 February 1861 and was buried in the Ballaarat Old Cemetery on 18 February (CN 1 8). Margaret moved to Little Bendigo near Ballarat East. She died on 16 December 1876 aged 46, and was buried in the same grave as her husband. He is recorded on the 1855 Electoral Roll, under the electoral qualification of Miner’s Right. This page was last edited on 30 August 2016, at 12:45.